I’ve developed a reputation around my neighborhood where I’m known as “the cook”. Hey – I’m totally fine with that. Because of that, my neighbors send me recipes to try. One of my neighbors moved to Florida about a year ago and she is still sending me recipes! Thanks, Diana! Keep them coming! She sent me a message on Facebook the other day and told me they have been hosting a couple of foreign exchange students from Asia. 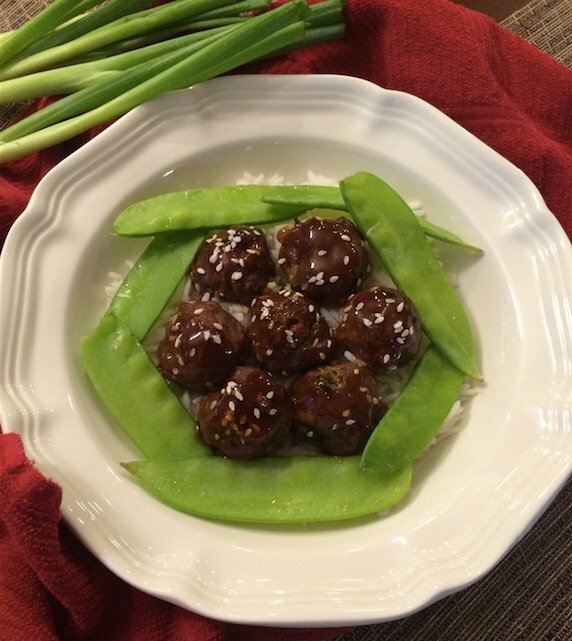 While they were staying at her home, they shared with her family an Asian Teriyaki Meatballs recipe for dinner one night. They said they make these meatballs all the time back in Asia. Because my friend loved these so much, she shared the recipe with me. Since you know I’m all about high protein recipes, I had to try these. They turned out yummy! My daughter loved them and I had to stop her at the 6th meatball she put in her mouth! First of all, these meatballs are super easy to make. They take no time at all to prep and cook. 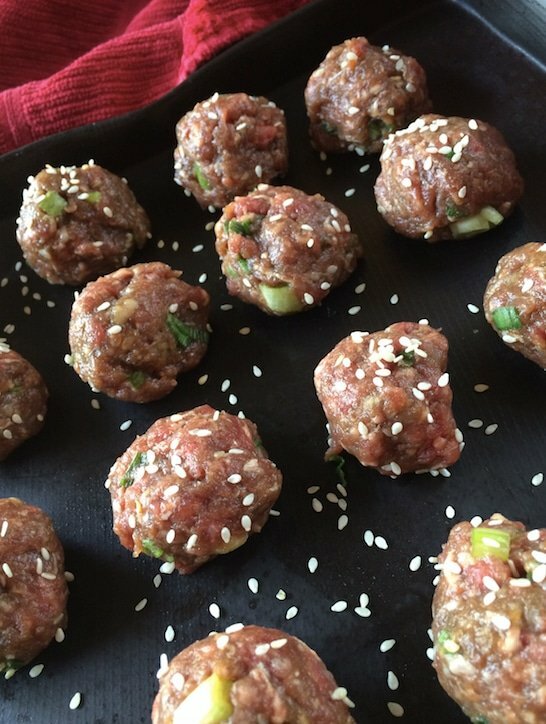 These meatballs have a nice taste with the fresh scallion and teriyaki sauce mixed into the meat. I love the fact that you marinate these little guys for 30 minutes before you roll and cook them. That makes a world of difference – don’t skip that part. These have great flavor with the garlic and onion powder that’s mixed in this recipe…man they were just fantastic! And yes my friends…Gluten Free (read your labels on the teriyaki sauce). You can eat these for lunch, serve as an appetizer, eat them as a snack or have them for a dinner item. 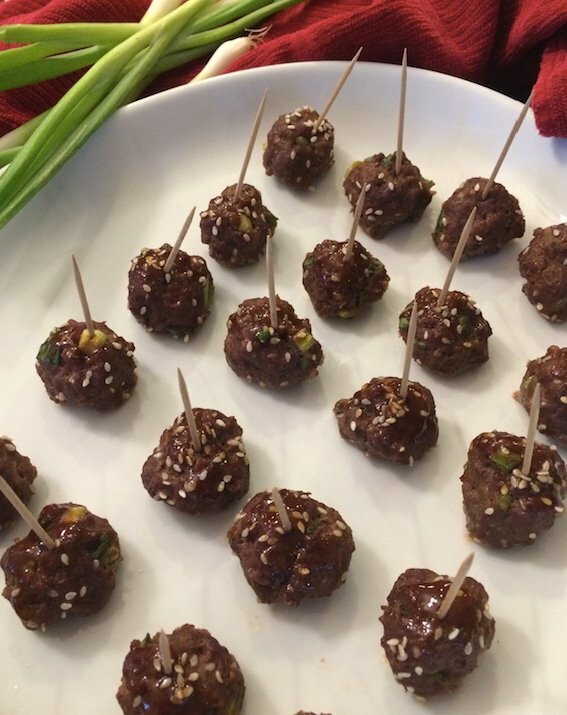 After they are done cooking, brush a little more teriyaki sauce on these meatballs. I served them over a bed of rice with snow peas and had them for dinner. The next day, these were my snack because they are so high in protein! They are so versatile! I love it! Mix all the ingredients in the ground meat & marinate for 30 minutes. When done marinating, form medium size meatballs. Place meatballs on a cookie sheet. I use Demarle non-stick cookie sheets. I LOVE their products! Bake at 350 degree for 30 minutes. 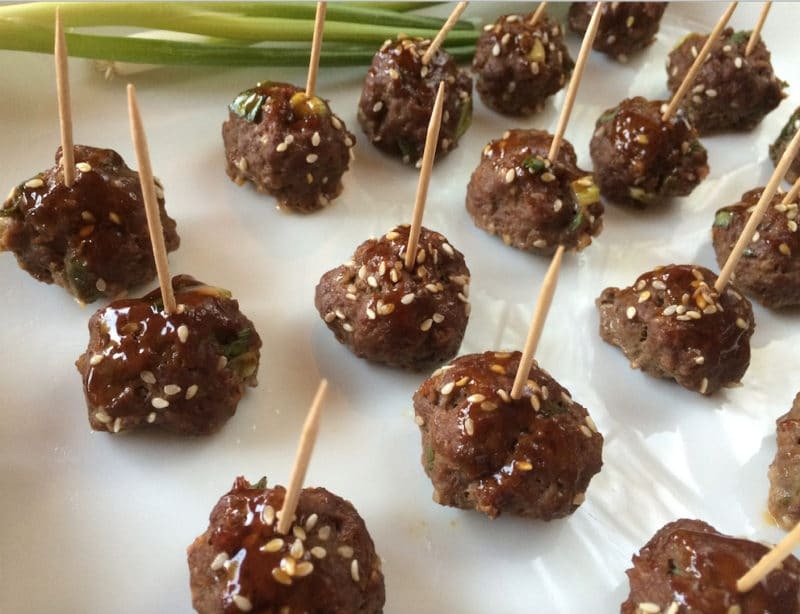 Brush additional teriyaki sauce on the meatballs for extra flavor as soon as they come out of the oven.